Learning that they weren’t even public relations representatives, I decided I’d write a restaurant review without their help, though their comments were appreciated. This restaurant had only been open five weeks and Steve was eating his “awesome” breakfasts there three times a week. The prices looked reasonable. Breakfasts, sweet and savory crêpes, and salads generally ranged from $5.95 to $6.95, and after briefly scoping out the place and meeting the real owner, Joan Samson, I promised to return the following Sunday for breakfast. Since I’m neither the infamous Taste Bud nor really a gourmet, I needed help for my first restaurant review, so I invited my wife, Diane, and our good friends, Jerry and Ruth Rosen to accompany me. More opinions than my own would be helpful … not that Steve’s “awesome” account wasn’t important. At 10am on the appointed date, the Rosens joined Diane and I at our La Galette breakfast table. We each purposely ordered different items, which promised to be wrapped in buckwheat or regular flour crêpes: sautéed mushrooms, with Monterey Jack and eggs; Chicken Apple Sausage Scramble Crêpe, with hash browns, onions, and cheese; and a Cherry Cheese Blintz Crêpe. My personal choice was the “Crêpe Monster” with eggs, actually Croque Monsieur with Black Forest Ham, Gruyere Cheese, Bechemel Sauce and scrambled eggs. Joan makes a beautiful leaf on her Latte's The ever-smiling and vivacious Manija Mayel took our orders, with the food arriving within minutes. 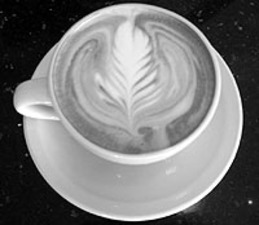 Joan welcomed us, and with our drink orders poured thick cream over the rich coffee, forming a white rosette on the surface. She does this for everyone. The four of us rated the breakfast wonderful. I visited the establishment a few more times to chat with customers, Joan and the staff, and to sample other tasteful offerings. Customer Jerry Coffin, a former San Clementean, has driven down four or five times from Mission Viejo because he liked the food and ambiance at La Galette. Rock Winberg, a recently arrived “surfer type” thought they had “…pretty good mocha” and he liked that “cool little thing” Joan poured on the top of it. This bistro is the only blender of the delicious La Colombe coffee, roasted in Philadelphia, the only such coffee in Orange County, which is created on the spot in the impressive espresso machine along with flavorful latte, cappuccino, and mocha. While soft classical music played in the background, Joan Samson shared her criteria for choosing the Pier Bowl location for her new restaurant, a former pizza café. She wanted a small town feeling, lots of foot traffic, and a gorgeous view. She desired a spot much like her former restaurant, Reverie Café, which she ran for four years in San Francisco near the UCSF Medical Center. In the short time since La Galette has been open, they’ve been constantly busy. Joan reports that 95% of her customers are repeat business, most of whom live in the Pier Bowl or spend their mornings or afternoons in the area. To that end, Samson buys all of her fruit and vegetable products, her perishables, early in the morning on her way to San Clemente from her Long Beach home. 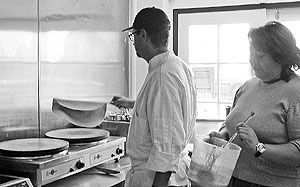 Joan Samson mixes it up as Todd Kimball flips one of his perfect crepes. Joan Samson may be the most highly educated restaurant owner in San Clemente. She has a bachelor’s degree from USC, studied Interior Architecture at UC Berkeley, and has a law degree from Rutgers. “I never practiced law. I just wanted to taste different educational experiences. I have a short attention span,” she joked. Nevertheless, the restaurant business was in her blood. She worked in eateries during her graduate and law school attendance, becoming a certified sushi chef. She opened her first bistro in San Francisco with former partner Ed Hodson, a financial services executive, who still helps her out on occasion at the La Galette as the espresso machine expert. La Galette also provides a bookshelf full of paperbacks to lend to patrons.